Before reading this enchanting book I had never heard of Markawasi. In the Andean mountains of Peru, north of Lima, is a high mesa rich in geological wonders. 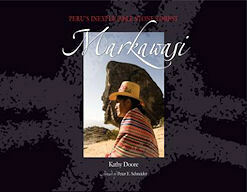 This coffee table book about the Markawasi plateau is a rich source of information about this mysterious place. Among other stunning geological features, there is a 'stone forest' atop this mesa. Many of the monolithic stones are curiously shaped, either by weathering (of which there is plenty in this often inhospitable place) and or by human sculpturing (carried out by pre-Incan residents of the plateau). The result is a menagerie in stone, beautifully presented in the book's stunning array of photographs. In the main body of the book, each stone, or collection of stones, is photographed both from distance and close-up. Additionally, a drawing is supplied to show clearly the depiction that has been rendered over time. A written description follows, aided by a precise GPS location upon the plateau. Many of these curious stones show human faces, while others seem to depict animals (some unknown in South America in more ancient times). The nature of the monuments suggests connections with Polynesia, especially Easter Island. Whether the anthropomorphic quality of the stones is a natural phenomenon aided by our propensity to see faces in any pattern, or deliberately rendered sculpture by ancient peoples (in turn subject to weathering) is an open question explored at length in the book. He believed that the origins of Markawasi's monumental designs lay in a proto-historical period, and that the peoples populating the place were derived from Phoenician explorers who had discovered and settled parts of South America. Although the evidence for such deep human roots on the mesa is tenuous, what is not in doubt is that the plateau was populated as early as the 13th century. Various ruins lie in quiet contemplation of times past, awaiting a more thorough archaeological assessment. He cannot rule out the possibility that some of the natural features have been accentuated by sculptors down the years. And like every visitor to Markawasi, he was struck by is spiritual qualities. The latter quality of the site is what draws Kathy Doore back time and again. She presents a chronicle of sightings of UFOs and other anomalous phenomena on the plateau, as well as spiritual insights gained from travellers who have made the arduous pilgrimage to the site. It is clear that Markawasi is a spiritual treasure for many of its visitors, irrespective of the controversy surrounding its origins. This book provides a feast of intimate spiritual revelations about Markawasi, helping to establish this off-the-beaten-track site as a true place of sacred knowledge. Additionally, there are heaps of travel advice to aid anyone wishing to view Markawasi in person. At 12000 feet, it is a daunting place to access. There's a three and a half hour climb from the small town of San Pedro de Casta to consider. Many of the book's most colourful images are derived from San Pedro de Casta. This harmonious microcosm of Peruvian life is as much a focus of the book as the stones of Markawasi; and offers a wonderful contrast between the vital colour of the present and the subdued introspection of the timeless rocks. A Monument to Humanity indeed! 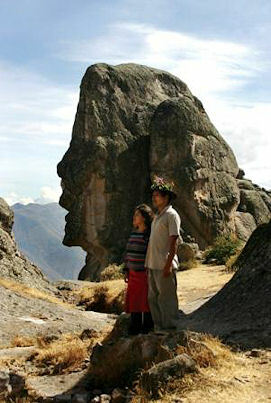 Subtitled "Peru's Inexplicable Stone Forest "